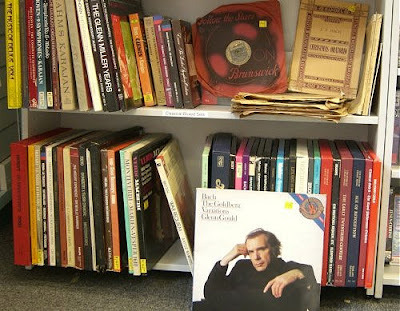 Nice to see classical vinyl generating excitement in today's Guardian, but not sure about the headline - 'A music anorak's treasure trove' which suggests classical music is some kind of nasty habit. Also it appears from the piece that the Guardian (and BBC's) Tom Service doesn't have a record deck. I'll let you into a secret. I don't have an iPod, but I do have a Thorens TD125, which I guess also makes me a turntable anorak. Elsewhere in the Guardian a late tribute to Herbert von Karajan adds little original but is good for a laugh with my old EMI colleague Peter Alward describing Karajan as 'very shy, a simple man with simple tastes'. Which is the best description of a very large yacht and Falcon 10 executive jet I've ever come across. The scary thing about that photo is that in my vinyl days of 30,000+ (yes, three rooms worth), I had every single album visible in that picture. AND I had pressings from such remote vinyl regions as Albania. AND I had that Thorens table at one time, but replaced it with a Rega Planar 3. However, as much as I loved analogue sound, I do concede that Digital technology (not the downloadable versions, mind you) since the mid-90's has improved tremendously, and that the 96/24 solution of the late 90's mached analogue. I think the real issue with Digital was not Digital itself, but playback. At the beginning CD's really did have sonic limitations (add to that the fact that some remastering in the early 80's was done on the fast and cheap to get back catalogue material out on CD as soon as possible, and you had a recipie for painful CD re-issues). This problem did not exist at all when the playback of Digital was either via BETA or RDAT. Obviously, not every one had the advantage of owning such equipment. All this talk of vinyl is all fine and well, but I wonder how many of us out there still collect and play pre-recorded open-reels?